Born 8 May 1926, the younger brother of actor Lord Richard Attenborough. He never expressed a wish to act and, instead, studied Natural Sciences at Cambridge University, graduating in 1947, the year he began his two years National Service in the Royal Navy. 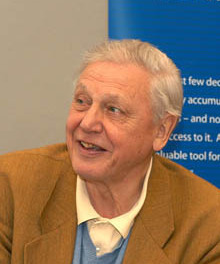 In 1952, he joined BBC Television at Alexandra Palace and, in 1954, began his famous “Zoo Quest” series. When not “Zoo Questing”, he presented political broadcasts, archaeological quizzes, short stories, gardening and religious programmes. 1964 saw the start of BBC2, Britain’s third TV channel, with Michael Peacock as its Controller. A year later, Peacock was promoted to BBC1 and Attenborough became Controller of BBC2. As such, he was responsible for the introduction of colour television into Britain, and also for bringing Monty Python’s Flying Circus (1969) to the world. In 1969, he was appointed Director of Programmes with editorial responsibility for both the BBC’s television networks. Eight years behind a desk was too much for him, and he resigned in 1973 to return to programme making. First came “Eastwards with Attenborough”, a natural history series set in South East Asia, then “The Tribal Eye”, examining tribal art. In 1979, he wrote and presented all 13 parts of Life on Earth (1979) (then the most ambitious series ever produced by the BBC Natural History Unit). This became a trilogy, with The Living Planet (1984) and The Trials of Life (1990). I knew about Life on Earth, The Living Planet, and The Trials of Life (obviously). I didn’t know that he’d introduced color TV to Britain and that he was responsible for “brining Monty Python’s Flying Circus to the world. What an amazing set of accomplishments. His contributions are simply astounding.